You don’t see this every day.. a naturally aspirated and stroked SR22DE with a 9,500rpm red line. 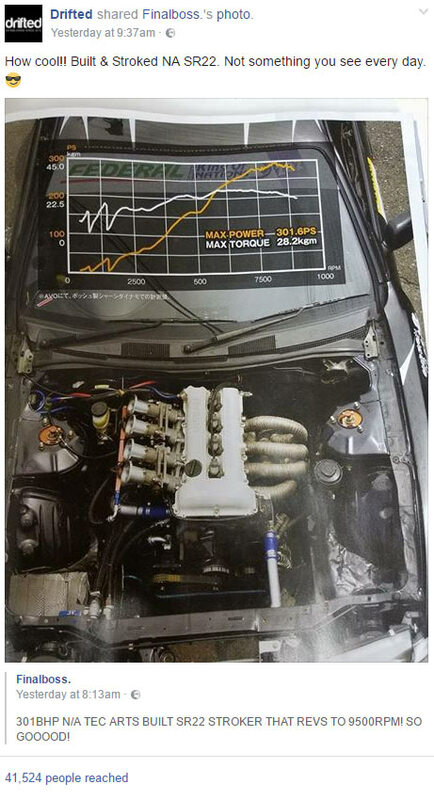 I spotted this gem over at the Finalboss Facebook Page, Japanese tuning house TEC-ART (of Keiichi Tsuchiya’s AE86 fame) built a very unusual but also extremely cool power-plant. When I shared this with our own Facebook community it blew up with interest. Clearly we enthusiasts enjoy seeing tuning done a little differently then the norm. The internals of this unique SR20DE have been upgraded with a 2,200cc displacement stroker kit, the sort of kit you would normally only find on a high horsepower turbo-charged SR20DET. An aftermarket fuel rail fitted with larger displacement fuel injectors keep the four velocity stack trumpets well fed with high octane gas. A heat wrapped tubular exhaust manifold and straight through exhaust system complete the engine package. Some kind of aftermarket engine management system must be keeping everything running correctly with a custom tune but I do not have the details on which ECU it is running as yet. The result of all this hard work and cash investment? 301 PS and a scorching redline of 9,500RPM. I can’t wait to share a video of this thing with you. If you really want to hit these power figures you should also consider combining tuned engines with high octane fuel boosters. Top marks to TEC-ART’s for building something very cool! Remember to join our Facebook community to see more cool posts like this. If you enjoy a tuned SR20 then why not check out our SR20 tuning guide? What do you think about this engine? Would you run it? Let me know what you think below.